KATHMANDU, April 4: The Election Commission (EC) is preparing to conduct elections in all 744 local units regardless of the parties' failure to reach consensus on settling the demands raised by the agitating Madhes-based political parties. Election commissioners say that they are firm on conducting the elections across the country on May 14, the poll date announced by the government, and that preparations are underway accordingly. "The government has mandated us to conduct the elections on May 14. We are firm on our mission and there will be no compromise in conducting the elections across the country on the said date," said Election Commissioner Ishwari Paudyal. This commitment from the election commissioners comes at a time when Prime Minister Pushpa Kamal Dahal has been proposing to conduct the local polls in two phases in a bid to bring the agitating Madhes-based parties on board the election process. "Conducting the local polls in phases is not a solution. 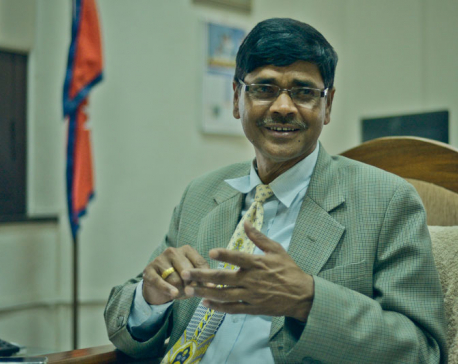 The government has already announced May 14 as the poll date and we are committed to achieve the set target," said Paudyal. The election body is in the final stage in terms of conducting the elections. It has already finalized voter rolls and most logistics of the total 67-types required for the elections have been arranged. Except for six districts of Province 2, polling stations have been fixed across the country. The EC has also already appointed chief returning officers and returning officers in all districts to begin local level preparations for the polls. So far, it has printed ballot papers for 65 districts including Jhapa, Morang, Sunsari, Kailali and Kanchanpur. "Soon after the printing of ballot papers is done for the remote districts, we will certainly print ballot papers for Province 2 districts," said Paudyal. Out of the eight districts included in Province 2, polling stations have been fixed in Bara and Parsa districts. Madhes-centric parties of the province have been demanding that the constitution amendment bill be endorsed before the elections and the number of local units be increased in tarai districts. The EC plans to fix polling stations in the remaining districts of Province 2 on its own even if the parties do not agree on the same. "Committees headed by the respective chief district officers (CDOs) in these six districts are waiting for the parties to forge consensus on the polling stations. If they fail to do so, the CDOs themselves will recommend polling stations in their dsitricts. And given the situation, the parties cannot complain against it," said Paudyal. As per its plan to conduct the local elections on the said date, the EC is now providing training to chief returning officers and returning officers in the districts. Immediately after the training, they will set up offices in the local units and start making adequate preparations for the polls. Apart from this, the EC has begun printing voter roll and voter ID cards from Sunday for conducting the elections in a free, fair and credible manner. The commission hopes to print more than 14 million roll and voter ID cards within the next 10 days.